This Superhero cake was for a five year old little boy's birthday party. The head of the cake is made from rice krispy treats iced in buttercream and the entire cake got an outer layer of homemade marshmallow fondant airbrushed in red sheen. There are approximately five dowels in the cake tier holding up the krispy treats head. The cake itself is half chocolate fudge and half vanilla with vanilla buttercream icing. The pan sizes used were 10 inches for the chest area, and 8 inches for the shoulders. When it was all put together it was nearly two feet tall. All of the decorative detail is made from fondant and the eyes were hand painted with a gold/silver sheen luster dust. 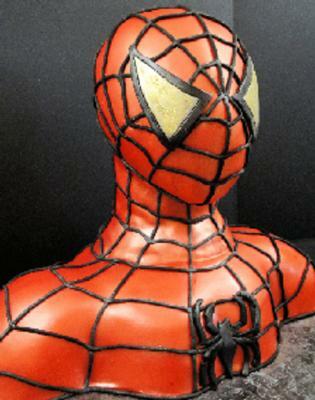 The webbing was made using fondant and an extruder to get the uniform lines and simply attached with water; and the spider decal on the chest was hand cut from using an exacto knife. All-together the cake took around ten to fifteen work hours to complete. I hope you enjoy it! Actually the cake was for a good friend of mine's son, I don't have kids yet :) It was very fun to make, just a word of caution- I know it may sound silly, but if you make this cake invest in one of those face masks lol- I was blowing my nose red for about a week after airbrushing this thing(it was a little disturbing); luckily I have a good tent system (tri-fold foam boards) so the color didn't get all over my kitchen. Yes I made the mmf myself the day before I assembled the cake (I usually make it the same day I do all the baking). The recipe I use is the same one as here, I just add my own flavors: http://cakejournal.com/tutorials/how-to-make-marshmallow-fondant/ I thought the website would be easier than typing it out, and they have a few pictures. hope that helps! I know you had fun with this cake. Your son must think you are a superhero mom too! Well done! A very dramatic cake. I liked the airbrushing! What a fun cake and I can bet your son and his friends loved it! Great colors, and good resemblance of Spidey. I love the 3D effect. The head and neck are all of piece of krispy treats- 2 large recipes. I tried covering it in two pieces, but ended up using three. One fondant piece covering the head, another for the neck, and a third for the torso. The torso was covered in fondant first, then I treated the head/neck like a second layer- I doweled it and placed the fondant covered head and neck on top. I planned it carefully so the lines of the webbing would cover all my seams. Hope that helps! I love this cake! I want to make it for my son's bday in March! Can you tell me is the neck made from cake or rice crispy treats? How'd you get the fondant to cover the whole thing? Was it one giant piece laid over the top and smoothed around him or seperate peices? I don't see any lines showing seperate pieces which is why I ask. I can't wait to try this!